A secret US Joint Chiefs of Staff (USJCoS) Memorandum from 1967 has been uncovered by Arutz Sheva analyst Mark Langfan. Langfan says the report proves that US Secretary of State John Kerry's current proposed security arrangements are a "military security fraud on Israel and the Jews." Kerry is currently in Israel, pushing his proposals for the Jordan Valley which Palestinian Authority (PA) Chief Mahmoud Abbas again rejected on Friday morning. Langfan has revealed in the past that the arrangements are based on the 1967 "Allon Plan," and are a "death-trap" for Israel. 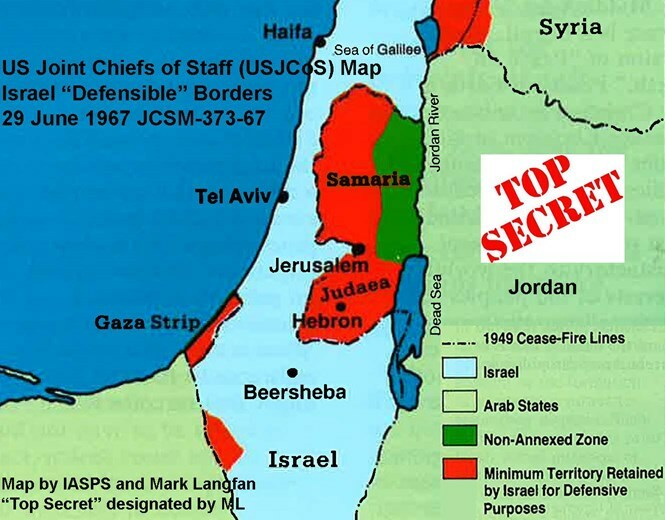 The newly revealed secret document, dated June 29, 1967 and referenced as "JSCM-373-67," take Israel's "defensible" borders as its subject. It was signed by then-Chairman of the USJCoS, US Gen. Earle G. Wheeler. The memorandum shows the necessity of Israeli control over the high ground of western Samaria. "From a strictly military point of view...the views of the Joint Chiefs of Staff...(see as necessary Israeli) control of the prominent high ground running north-south" through Judea and Samaria, reads the report. Langfan notes that this region, deemed crucial for defensible Israeli borders, is the very area that is slated to be given to the PA under Kerry's plan. 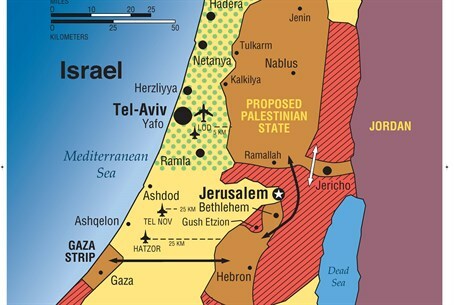 Furthermore, the memorandum's appendix elaborates that Israel at minimum needs a defense line along "Bardala-Tubas-Nablus-Bira-Jerusalem," which "would give a portion of the (Judean and Samarian) foothills to Israel and avoid interdiction by artillery in the Israeli villages in the lowlands." Langfan remarked "in 1967, before shoulder-fired anti-air missiles, before laser-designators, before radar and radio-jammers, before Katyushas from Lebanon and Gaza, before rampant Muslim-on-Muslim use of Sarin-tipped-chemical-Katyushas in Syria, the greatest collection of military professionals in the world concluded Israel's retention of Western Samaria was a military necessity for Israel." However, Langfan points out that a more insidious problem than Kerry's "fraudulent" security plan exists. "(The) real problem is that for years, Israel's entire military establishment has generally signed onto the ‘Jordan Valley Concept’ that wholly contradicts the professional written military conclusion of the United States Joint Chiefs of Staff," reveals Langfan. Through the Jordan Valley arrangements that have been commonly promoted, Israel would abandon Judea and Samaria to various degrees, keeping a security presence in the Jordan Valley. Langfan notes the indefensible nature of such an arrangement. He remarks that the 1967 memorandum "prophetically predicted the likely advent of Katyusha rockets from Western Samaria into Israel's" population centers, referencing a strategic threat that he has warned of in the past. Langfan called for a a commission of inquiry, such as was conducted after the disastrous 1973 Yom Kippur War, to determine how "such a military hoax could have been perpetrated by the IDF, and successive Israeli-governments." He further volunteered to "be the first to testify, and name names." "Israel should have a 'commission of inquiry,' before it suffers a catastrophic irreversible defeat, not after 10's or 100's of thousands of Jews are murdered as a result of Israel's endemic military failures," warned Langfan.